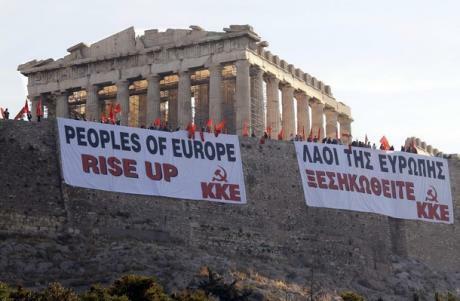 KKE banners flutter on the Akropolis, calling on the peoples of Europe to rise up. A general strike has paralyzed the country; hundreds of thousands are on the march or stopped work; foreign leaders express their dismay; the government considers a national unity cabinet. Surely this must have been the scenario feared by the Royalists and reactionaries in the Greek Civil War, and by the colonels in their coup of 1967. But thanks to the greatest economic crisis capitalism has caused since the 1930s, it has become reality in the Hellenic Republic in these staid times of ‘liberal democracy’. With the financial and economic crisis hitting the debtor nations the hardest, the Greek government has been utterly unable to pay its outstanding debts and in order to save the European common currency it has to negotiate with its creditors in Europe and the IMF for a ‘bailout’ rescue plan if it is not to declare bankruptcy altogether. In first instance, it seemed a rescue package worth several billions spread over several tranches would be sufficient to save the Greek government’s financial position, but with economic conditions deteriorating by the day even these have not sufficed. The latest negotiations have seen creditors and ‘rescuers’ forced to accept an effective partial default of Greece on all its outstanding bonds of at least 50%, probably more. However, such things are not done out of the goodness of the hearts of the friends of civilisation and freedom in Paris and Berlin. The penalty is to be paid by the people of Greece, as well as those of other southern European countries put at risk by the domino effect of ever diminishing bondholder confidence. The capitalist system knows no mercy, only the harsh demand that every debt is a credit, and this equation must equalize at whatever cost. With the threat of wholesale European monetary and credit collapse looming over them, the social-democratic government of Georgios Papandreou has seen no other choice but to implement the harshest programme of austerity Greece has known since the 19th century. This has led to a general strike against him and a chaotic confrontation outside the Greek parliament, in a sense the true ‘mother of all parliaments’, with KKE unionists and other demonstrators clashing with each other as well as riot police, while the assemblage of MPs passed the measures which would present the costs of the credibility of the eurozone in times of crisis to the Greek people. In a last-ditch attempt to salvage their democratic credibility, the PASOK leadership under Papandreou announced, without even informing their own cabinet, that a referendum was to be held on the question of continued Euro membership. The very notion of a democratic decision on the economic future of the country was met with howls of outrage from the creditor’s governments abroad, as well as the liberal opposition party ND and even Papandreou’s own Finance Minister, Evangelos Venizelos jr. Papandreou was forced to withdraw the proposal. Even as I write, he has narrowly survived a confidence vote but is effectively forced to create a ‘national unity’ government with the opposition under Venizelos’ leadership, which will use its great majority of MPs (never elected under such a platform) to pass futher punitive measures on the Greeks. As always, when in a ‘liberal democracy’ liberalism and democracy come into conflict, it is the latter that loses. All the parliamentary formalities that normally hide the operation of the bourgeois state are thrown aside – the veil is lifted, and briefly all can see that the interests of small numbers of bondholders in Athens, Berlin, Paris and Washington supercede anything the Greek people may desire. But such moments in which liberalism shows its true face are always moments of crisis in the double sense of the word. The Greeks themselves bequeathed this word to us, and it means a moment of confrontation, a moment where all can go wrong but also a moment of decision. All eyes are now on Greece as the first of the debtor nations which may buckle and collapse under the force of capitalism’s crisis. If it does so, others are expected to follow, such as the severely weakened economies of Italy and Spain. For the Greek people themselves, however, the cure is worse than the disease. To resolve the crisis of capitalism by capitalist means implies the restoration of the profitability of the banks, the credibility of the Euro bonds, and the victory of the creditor over the debtor: it means the great suffering of the majority in the interest of the wealthy minority whose property and interests are at stake. Now is the moment the Greek people and all of us decide whether we choose this path. An alternative path exists. While most Greeks still have faith in the Euro as the guarantee of peace in Europe and the stability of their savings, a withdrawal from the currency would give Greece the opportunity for an independent policy. For this to be meaningfully on an international scale, it is not sufficient simply to devaluate under a Drachma and in so doing wipe out the creditors and the people’s savings alike. It must go further: the only opportunity is for Greece to declare a general default, to announce what David Graeber has biblically called a ‘Jubilee’ cancelling all outstanding non-commercial and state debts, and to prepare the way for an independent, socialist Greece which will never again risk its people’s living standards by hitching it to the destructive Juggernaut of international capitalism. This, too, means a better use of the state’s finances: instead of spending a proportionally massive percentage of its budget on sabre-rattling on the Turkish border, it would do better to restore Greek industry, improve the lamentable condition and inequality of Greek healthcare and education, and to disempower the monopolistic shipbuilders as well as the reigning political cliques. It also means the willingness of all Greeks to contribute their share to the reconstruction of the country, which in turn can only be done when a new government with a new approach regains the people’s trust. Only in this way can Greece have a lasting future. One should not be so naive as to expect the powers in Washington, Berlin and Paris will allow this, nor will the ruling elites in Greece itself. It is no coincidence that the outgoing Papandreou government replaced, by surprise, its military commanders. The Greeks have all too fresh a memory of the Colonels’ Regime of 1967-1973, when right-wing militarists seized powers out of fear for the victory of the left; thousands were tortured, imprisoned, exiled and murdered in order to assure NATO her frontline base in the Cold War and the shipbuilders and landowners their property. Such a thing is not inconceivable even today. While it is not in the interests of Merkel or Sarkozy to drop liberal democracy just like that, big business interests may consider the option – Forbes already ‘jokingly’ suggested it. More likely is the ability of a ‘unity government’ to declare a state of emergency and in so doing attempt to destroy the unions’ and the demonstrators’ independent ability to resist the programme of austerity. Only the organised power of the Greeks can oppose them and prevent this, and in this they will need all the practical support from their friends in Germany, France, the United States and elsewhere they can get. One should not imagine this crisis has seen its worst yet, and no Chinese deus ex machina will step in to save capitalism – it cannot be saved but at a cost so great that it is not worth paying. In the 19th century, the bankruptcy of many minor and middle-level powers, consciously engineered by their Western creditors, allowed the colonial or quasi-colonial takeover by Britain, Germany or France. In the 1930s, the Great Depression could only be overcome by the destruction of the Second World War, the greatest military cataclysm the world has ever seen. Only this wholesale destruction could destroy enough value to restore profit rates to the survivors so the system could continue. Shall our motto once again be: Vae Victis? Or shall we finally do away with this system, and say this time: Workers of the World, Unite? NB: There is an interesting comparison to be made here with the article I wrote on the effects of the crisis in Greece in February 2010, when the effects were only just being fully felt. I was right to predict the necessity of a bailout for the EU major powers, but sadly the individual pressure on an isolated Greece I warned against has come to pass. Are you still working on this project, by any chance? Eventually, yes. It’s not a very high priority though.